With advances in sequencing technologies leading to a so-called “data deluge”, the amount of data supporting a biological study is becoming increasingly unwieldy and difficult to make available. These issues have led to a lack of transparency in analyses of sequencing data, resulting in an ever-increasing reproducibility gap. There is a need for tools, pipelines and computing platforms that will enable biologists to better utilize the vast data resources available to them, in a manner that facilitates the interoperability and integration of data. 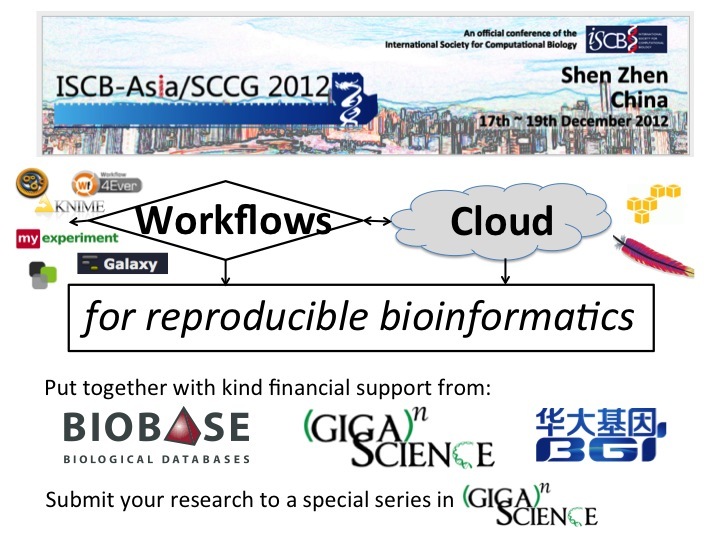 As these are all key issues of importance to GigaScience we have organized a session at the ISCB-Asia meeting in Shenzhen next week, focusing on advances in cloud computing, workflow systems and data platforms that will provide biologists with the tools to stay afloat in this data-rich environment. As you can see in the fantastic program and line-up listed below, the session is bringing together a number of experts working on many of the workflow systems and platforms (including Galaxy, myExperiment, Taverna and Knime), experts utilizing these and other systems in the cloud, and will also cover other areas promoting data reuse and reproducibility such as semantic technologies, data management and interoperability. We look forward to the session as well as the rest of the ISCB-Asia meeting, the first Chinese meeting organized by the International Society for Computational Biology (of ISMB fame). Co-organized and hosted by our publishers BGI in Shenzen, on top of our session there is an exciting program of keynotes (including Phil Green, Eric Xing and Takashi Ito), highlight and proceeding tracks, as well as sessions on cancer statistical genomics and computational statistics. We’d like to thank Biobase and BGI (via GigaScience) for helping sponsor some of the talks, and the conference organizers at BGI and ISCB (including our editorial board member Paul Horton) for helping us make it happen. For those not fortunate enough to attend we’ll be tweeting (follow @BGI_Events and @GigaScience and the hashtag #ISCBAsia) and try to post the slides on our GigaScience slideshare account. We also be announcing a new series in the journal to highlight exactly this type of research, and will highlight where are with our Galaxy-based data platform. If you have papers you would like us to consider and integrate here please let us know, as BGI is generously covering the article processing charges of any submissions until July 2013. UPDATE 27/12/12: The slides are now included next to the speakers names and we have also archived a storify of all of the tweets from the meeting. We’d like to thank all present (especially the speakers and sponsors) for an enlightening and interesting session. Thanks for sharing about next generation work flow system!